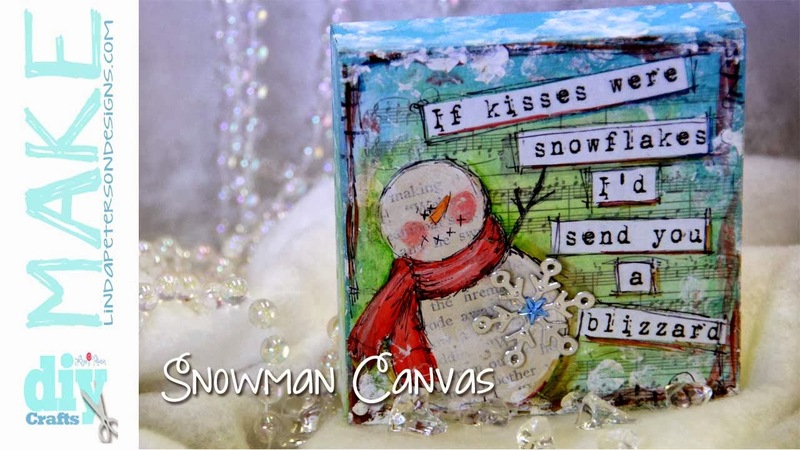 Art from Art + SNOWMAN ART! 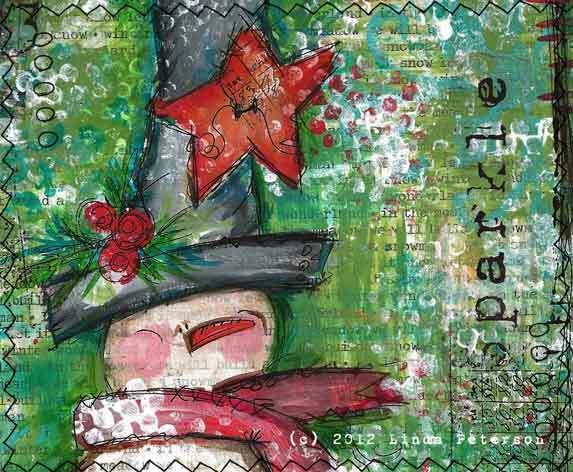 The only thing that resembles winter around here in southern Missouri is my artwork! Today it was over 60 degrees and felt like a spring day! If I’m not mistaken – isn’t this WINTER? While I was in the studio creating, Mariah was inside baking my favorite snowflake sugar cookies!! This past weekend I’ve been on a crazy snowman kick! 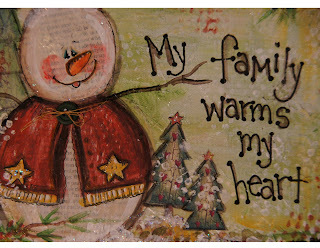 I LOVE snowmen, I love snow, I love playing in the snow, I love how snowmen always bring a smile to my face. They are sooo much fun to create, whether it’s from polymer clay or on a canvas. I think winter characters are by far my favorite to create. I’ve completed three one of a kind journals this weekend. I’ve scanned them all in, imported them into photo shop and with just three original pieces, I was able to create a variety of additional art that I’ve since turned into notepads, bookmarks, greeting cards. Got so many ideas oodling……I don’t know if I’ll be able to come up for air! 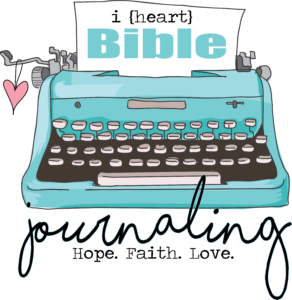 I swear, I never intend to go a whole month without writing a little something something, but it seems that’s exactly what happens as the days go by with a blink of an eye. 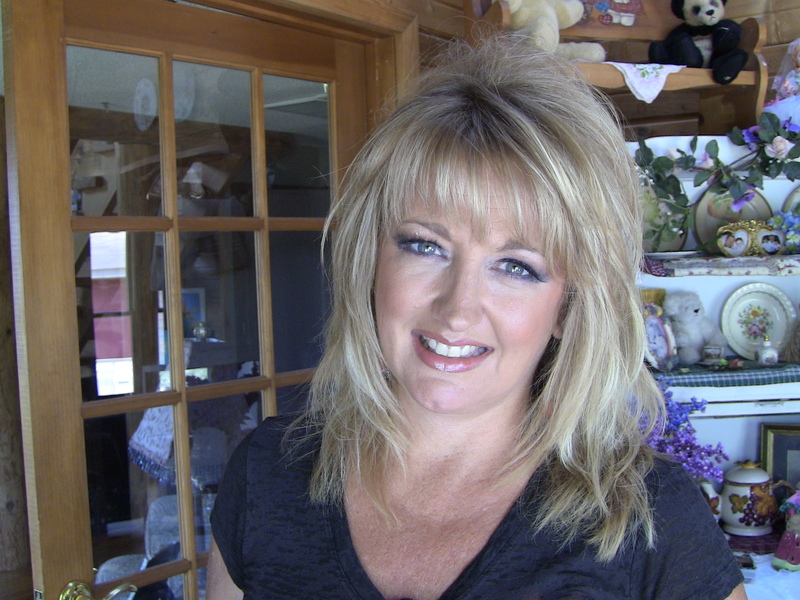 I’ve been busy – swamped with designing projects for my WebTV show – Creative Life. 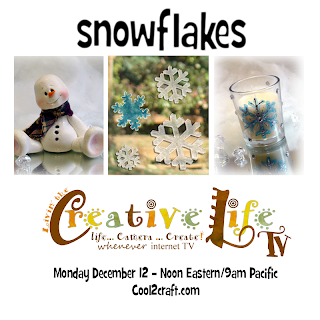 The next show airs December 12th and is inspired by Snowflakes. I love glitter and snowflakes remind me of natures glitter. And who can resist adorable snowmen? 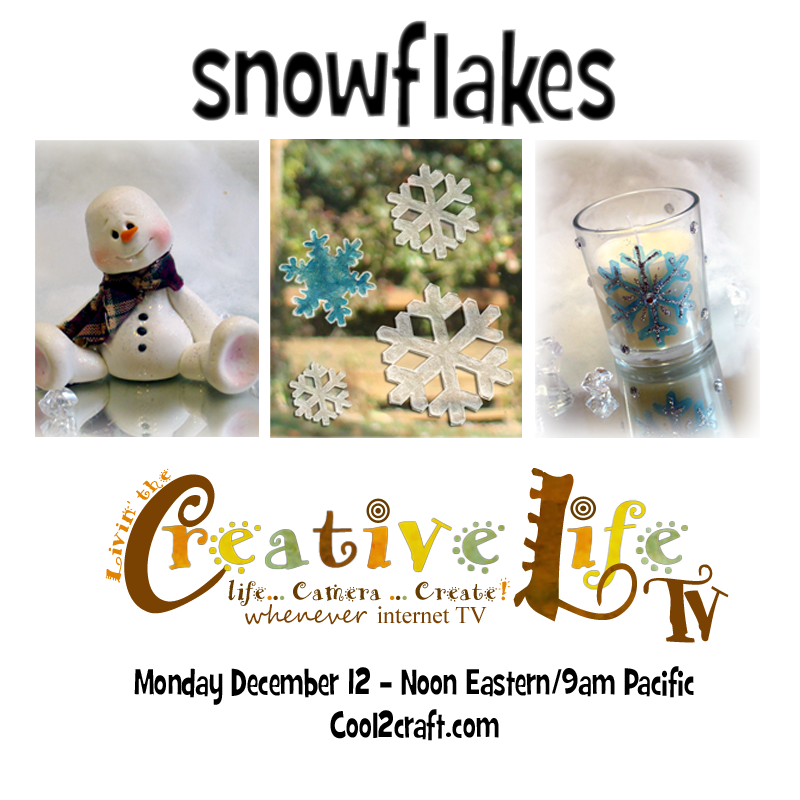 So here’s a sneak peak at the projects you’ll see on the next show on the Cool2Craft network. 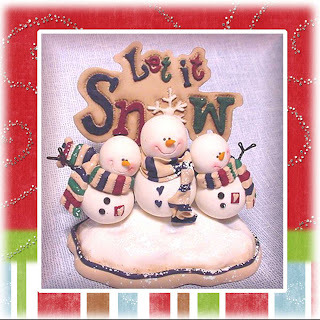 Among the favorites, I’ll share how to make a snowman from polymer clay, decorate your windows and make you’re own window clings with Aleene’s Tacky Glue and how to etch glass. Fun fun fun!!! This time of year is also when the Scrappin’ Sisters get together for our semi-annual retreat. We had a great time and the younger girls kept us in stitches in the middle of the night with their antics. I love being with all my creative friends. This year, I didn’t scrapbook, rather I worked on book projects for my upcoming Mixed Media book. I’m so so so excited about this book as it combines everything I love to work with, metals, paints, glue, ink, found objects and above all I get to get messy!!! I remember going to War Eagle craft show back in the early 80’s. It was our mother-daughter day. Every year it was brutally cold – and I mean brutal. And every year it was muddy when the sun warmed up in the afternoon, but that didn’t deter us. We just piled on layers of clothes and wore boots! It was at this show that I discovered artist Jan Hagara. She did beautiful drawings of children from the vintage era. I saved up enough money on year to even buy a doll ornament – which I still have in the original box. 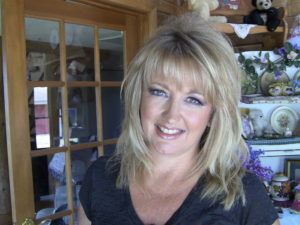 She was an inspiration to me and I always remember her sweet little girls faces. 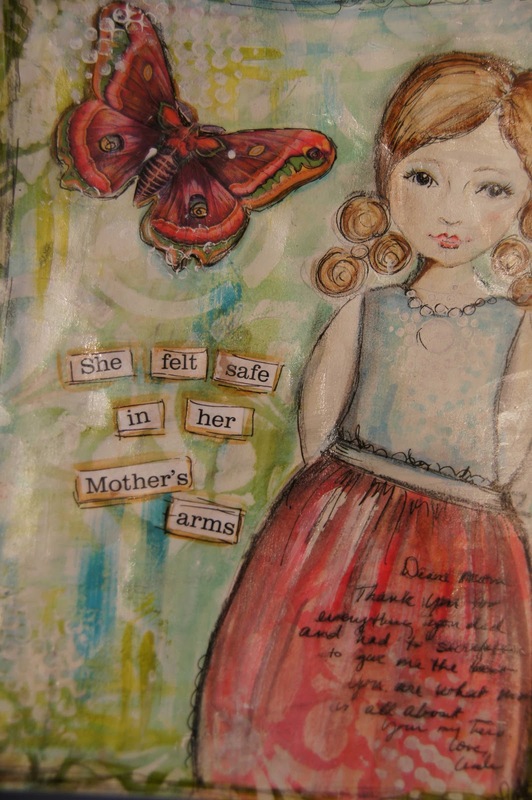 I think it was this memory and the days spent with my Mom going to the fall craft shows that inspired this piece. I sketched the face, colored with watercolors and acrylic paints and added layers and layers of texture. I’m thrilled with the results – quite out of my comfort zone for sure. 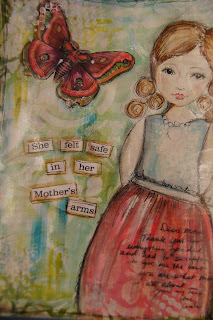 Yes, there is something about being safe in your Mother’s arms don’t you think? I’ve created several more pieces since then. Last week we went to Iowa to spend time with family. I really enjoyed this time so much and especially the time I had with my Mother In Law, Sister in Law and my Neice and Nephew. I spent the weekend teaching the kids to draw and I was blown away by their talent! Here is a picture Riley drew from one of my pieces! Isn’t it awesome? Powershopped on black Friday – got some amazing deals and had a fabulous time!! And Saturday, we just sat around the house in our jammies and crafted. 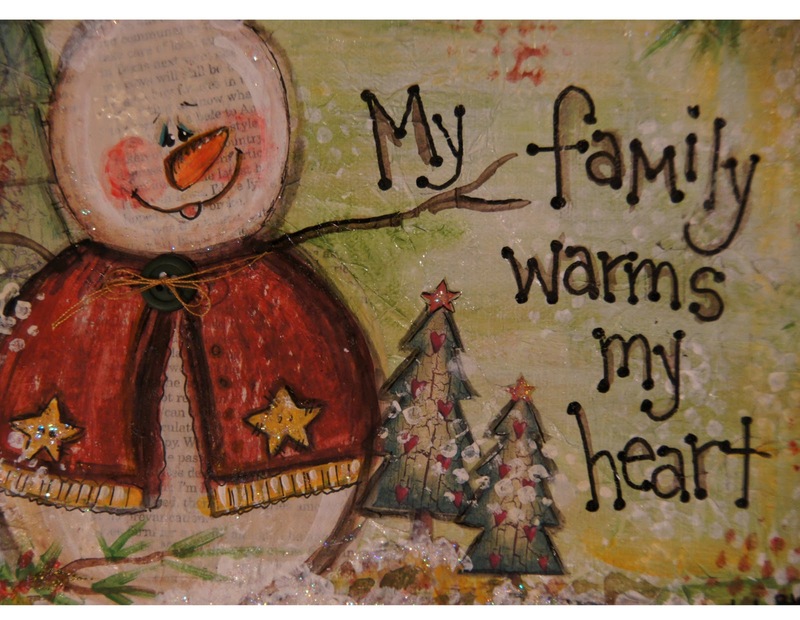 I whipped up a couple of gifts for my family with this snowman collage. So now we’re home and I’m back designing more in the studio for my show in February – Crazy Mixed Up Art and my mixed media book too!! 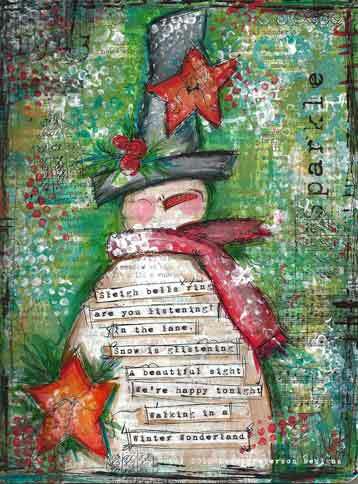 Lookin forward to a fun, creative winter and lots of crafting in my PJ’s!! !